In 1955, he married a Muslim woman, Juanita Grubbs, and some sources indicate that in 1957 he converted to Islam. If in fact he did (evidence being scant), he did not stay with the religion very long, exploring Hinduism, Buddhism, Kaballah, and a variety of other theologies in the early 1960s. 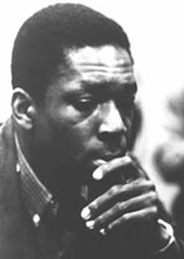 See also Bill Cole, John Coltrane (2001), page 14: "More than anything, the nation of Islam opened [Coltrane] up to Africa and his awareness of Africa, merely as some far-distant continent where his descent could be traced from, but as a real and living source for him, irrespective of where he might be. His acknowledgment of that was spelled out in several ways: in the many pieces that he composed and gave African names to; in the fact that he was in his time one of the foremost rhythmic players in jazz; and, perhaps more than anything else, his world view concepts. He realized the vastness of the universe and in that vastness he was a minute organism. His awareness of that is evident especially through the names of his later compositions."